Republican Speaker of the House John Boehner has had the worst time straddling the line between the activist conservative and the establishment wings of the GOP–with a lean toward the establishment the whole time–and the result seems to be that he’s satisfied nobody. A new poll shows that Republican voters overwhelmingly want him fired as Speaker. The new poll from Pat Caddell’s organization Caddell Associates shows that Boehner is not popular outside the GOP establishment. In response to that question, 34 percent of the GOP voters surveyed said they definitely want someone other than Boehner and 26 percent said they probably want someone other than Boehner. Only 11 percent said they definitely want to keep Boehner and an additional 15 percent said they probably want Boehner to stay. 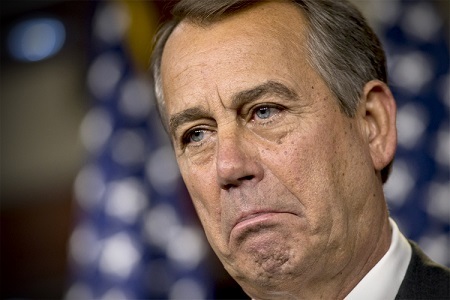 So the poll says some 60 percent of GOP voters want Boehner gone, while just 25 percent want him to stay. Fifteen percent in the poll either don’t know, or are undecided on Boehner’s future. In addition to that condemnation of Boehner, 64 percent of the GOP voters surveyed either strongly or somewhat agree that Boehner, as Speaker of the House, has been “ineffective in opposing President Obama’s agenda.” Only 24 percent either somewhat or strongly disagree. Twelve percent didn’t know. What do you think? Should the GOP dump John Boehner?